Deer are notorious for invading home gardens and proceeding to munch away on everything from hydrangeas to the new buds of dogwood trees. These beautiful but hungry animals are not easy to keep out of your garden. They will easily step or jump over most fences and are too smart to be fooled by man-made distractions. The best way to keep deer out of your garden is to know what plants deer eat and avoid planting them. Deer will feed on woody plants no matter the season, according to information published by the Arkansas Game and Fish Commission. Woody plants refer to shrubs, trees and even vines. 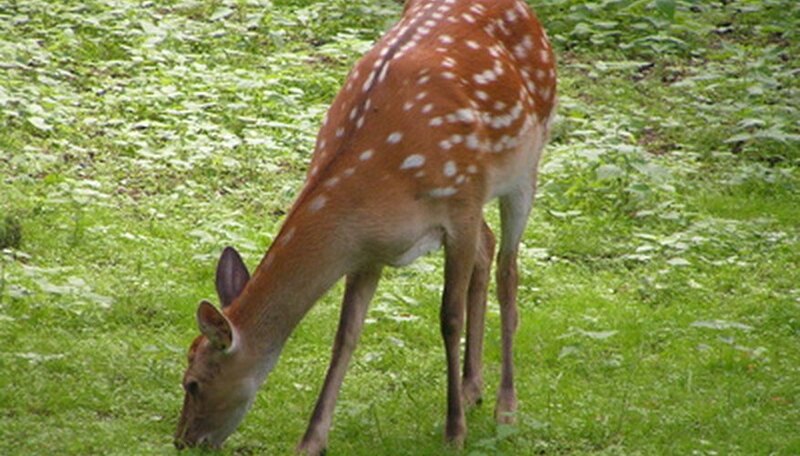 Although woody plants are low in nutrients, deer love the tender twigs of these plants. In the spring, they will decimate the buds before they even get a chance to open. Some of the more common woody garden plants that deer eat are azaleas, crabapple and apple trees, clematis, honeysuckle vines, red cedar and willow trees, oaks and even roses. Forbs are herbaceous plants that are not grasses. These are nutritious for deer, according to information published by the Arkansas Game and Fish Commission. These highly desirable garden plants include violets, aster, goldenrod, sunflowers and legumes. Dandelions are also a commonly eaten forb. Deer will also eat fruit and grasses, especially in autumn when they are storing up fat for the winter. Persimmons, blackberries, strawberries, blueberries, wheat, ryegrass, lettuce, cherry, plum and peach trees are all commonly consumed by deer. Deer will also eat wild grasses and acorns.